Eating and cooking outdoors is a great way to enjoy time with family and friends – sociable fun and the opportunity to show your expertise with the grill need not be limited to bangers and burgers, writes Neil Gow. Perhaps, though, if you want to be a little more adventurous with your al fresco cooking, it is time to upgrade your barbecue so the sky becomes the limit to your culinary expertise! The Cadac range of grills, designed and built in South Africa – some say where barbecuing originated – certainly have the style and features you will need. From just the basic grill plate (albeit the ThermoGrill for easy clean and better, faster cooking from improved heat distribution) to the hot plate, the teppanyaki plate, the pizza stone or the rotisserie – the only limit will be your imagination. At Fresh @ Burcot Garden Centre, we have been barbecuing for many years. From basic charcoal, we have progressed to the latest gas models from Cadac. With years of practical experience behind us, we are there to help you get the most from your outdoor cooking experience. Pop in and view the new Cadac range and see what you can do. 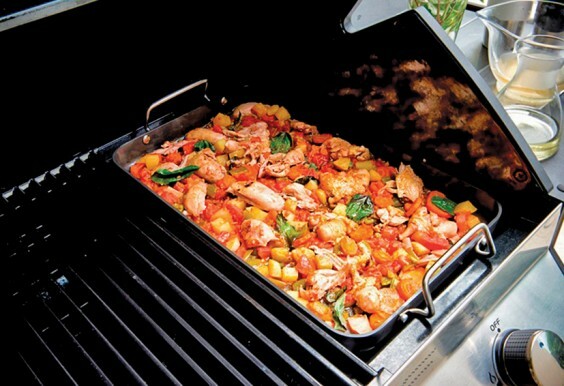 And just to get your juices flowing, try our recipe for Summer Chicken Stew – yum, you can smell summer already! 2. Stir in tomatoes (with juice), chicken stock, basil, tomato sauce, bay leaves and thyme. 3. Grill chicken briefly and place in the non-stick coated warmer pan. 4. Leave to cook on a low heat for about 30 minutes. Stir frequently and turn the chicken after 15 minutes. 7. Add cornflour to the mixture. Make sure the mixture is cooking otherwise it won’t thicken. 8. Remove bones from the chicken and chop the meat into small pieces. 9. Add chicken to vegetable mix and heat together. TOP TIP: This is delicious served piping hot with fresh baked olive bread to soak up the juices, and a nice glass of chilled English white wine from the Sixteen Ridges Vineyard just north of Worcester. Neil Gow and his wife Nicci are co-owners of Fresh @ Burcot Garden Centre.